Overwhelmed by paperwork and financial affairs? Whether you own a business or need personal assistance with your own finances, Penny Corbett can help. She can do everything from monthly bank and credit card account reconciliation to bookkeeping and tax preparation. Posted on Mon, Sep 17, 2012 : 5:57 a.m. It was our anniversary show this past weekend — three years of the Everything Elderly radio program! 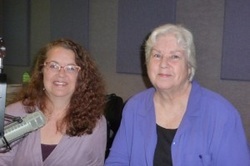 For this special show we had two wonderful guests, with Dianna Huckestein joining us first. Dianna is the vice president of marketing and communications for Evangelical Homes of Michigan. Our next guest on our anniversary show was Penny Corbett. Penny is the owner of Jorn Court Associates providing personal bookkeeping services. Penny has an abundance of relevant personal and professional experience managing finances. She started her business at the urging of Kathryn Greiner at the University of Michigan Credit Union. Penny has many wonderful clients, more than she anticipated. While she originally thought she would provide service exclusively to the elderly and their families, she has also found that many professional women are just too busy to keep track of their financial lives and have benefited greatly from her assistance. We enjoyed hearing how one client calls Penny her "bookkeeping angel." She offers an extensive array of services including paperwork organization, monthly budgets, bank account reconciliation, help with setting up trusts and wills, tax returns, online bill paying, notary services and much more. Before she beings working with a client, Penny meets with them to really understand their situation and their needs. Then a simple agreement is signed to document the services to be provided and the payment schedule. Penny's fees are less than a CPA or financial planner. She is insured and bonded, with plenty of references available. Penny also has a website, jorncourt.com, with lots of useful information and an entertaining blog that includes some pretty good jokes. Penny advises people to not be afraid of their finances. Many people are a bit scared to really look at their situation and continually put it off. Penny has found that these folks feel more empowered after getting some help and getting organized. To get in touch with Penny or Jorn Court Associates, call 734-355-1221 or visit the websitejorncourt.com. Alan Caldwell and Sheila Doeden co-host Everything Elderly every Saturday morning at 8:30 on 1290 WLBY. In their day jobs, Alan and Sheila co-own and co-manage Senior Helpers, providing in-home care services, primarily to the elderly. Both can be contacted athomecareexcellence@seniorhelpers.com, or at 734-927-3111.